Our Colmant 2019 harvest is in full swing, with the Chardonnay and Pinot Noir looking promising. It is a year of exciting changes and growth at Colmant. In our continuing journey to produce the finest boutique Cap Classique in South Africa, we are thrilled that Paul Gerber, one of South Africa’s leading Cap Classique makers, will be joining the Colmant Cap Classique and Champagne team as winemaker. Paul comes with a wealth of knowledge. He is also currently doing his master’s degree in “the use of cork as a closure and winemaking tool for bottle fermented sparkling wines during ageing on yeast lees” in collaboration with Stellenbosch University, the University of Rheims in Champagne and the research bodies Winetech and Nietvoobij in Stellenbosch. Paul started his career as a maths teacher. His wife, Dr Berna Gerber, is a senior lecturer of the department Speech and Language at Stellenbosch University. They have a small son, Jean, who adds even more sparkle to their lives! 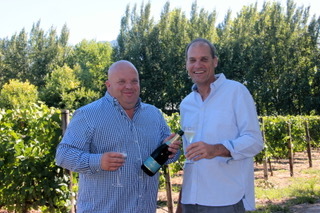 Paul and JP Colmant will be joining their passion to further grow the quality of Colmant Cap Classique, as well as the Cap Classique category in South Africa.